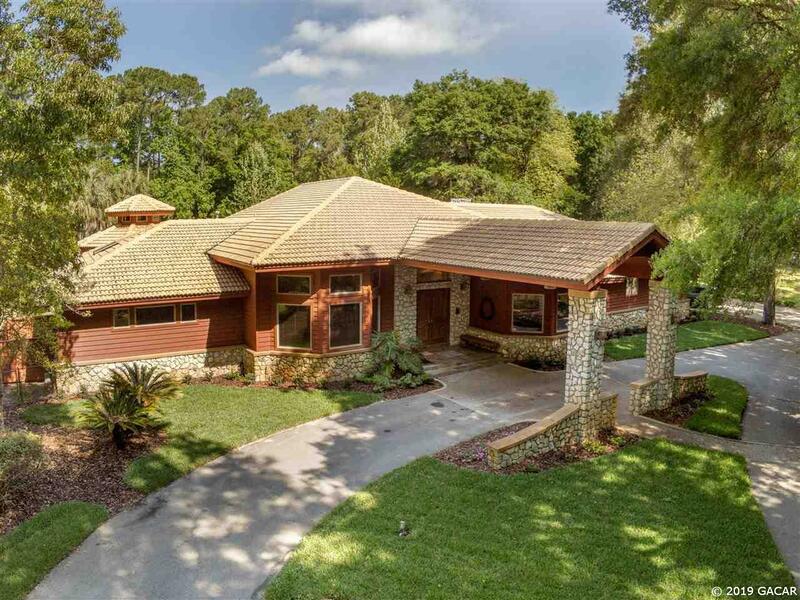 Beautiful gated 4 acre property & custom pool home with a porte-cochere & terra cotta roof boasts a grand foyer open to formal living room with view of the sparkling pool, formal dining room currently serving as music & entertainment room with removable bar & stage, serving counter between dining & kitchen & generous office/den/flex room. Spectacular Master Suite w/20&apos; cupola, wet bar & sitting area perfect for relaxing with your morning coffee or evening glass of wine, large walk-in Swiss steam shower, oversize jetted tub & spacious walk-in closet. Chef&apos;s kitchen includes stainless refrigerator & double ovens, plus a gas stove, breakfast nook open to grand family room w/stone fireplace (wood or gas). Bedrooms 2 & 3 share a Jack & Jill bathroom, walk-in shower & tub. The bonus room is a great game, exercise or flex space. Updates include: Refrigerator, dishwasher, tankless water heater, AC units, water filtration, most flooring & more NEW since 2015 and pool refinished 2014. Extend entertaining outdoors on your peaceful property complete w/Gazebo, Koi Pond & pool amid mature landscaping, flowers and fruit trees.